It has come to our attention recently that there is reason to question the Arduino team’s commitments to its community and to open source hardware. Dale Dougherty posted on the Make blog about Arduino’s apparent lack of progress toward their announced Arduino Foundation. Phillip Torrone posted to the OSHWA mailing list about Arduino products that fail to meet the basic criteria of open source hardware projects. These are both troubling. As members of the open source hardware community and members of the Arduino community, we would like to add our weight to the call for Arduino to return to their open source hardware roots. We love Arduino and we, along with a large and diverse set of communities, have benefitted enormously from the breadth and depth of the Arduino family and its resources. This is an exciting era for Arduino and for open source hardware, with the debut of the first Arduino and compatible boards based on silicon level open source hardware. However, we are deeply concerned that several recent products from Arduino are claiming to be open source but upon research, indeed do not appear to be so. Arduino, once one of the standard bearers in our community, now seems to be falling into the grey area of OSHWINO (Open Source Hardware in Name Only). We would like to openly call for Arduino to immediately publish the missing design files and license information for these products. Even from a basic truth in advertising perspective, future products labeled as open source need to have these requirements met by their time of release. We also join in Dale’s call for bringing the Arduino Foundation into existence: it is more clear than ever that Arduino needs to renew its promise to the community. Update, July 28, 2017: Arduino appears to be under new managment, with Massimo Banzi in a larger role. We are optimistic that this represents a major turning point in the story. This entry was posted in Open Hardware. Bookmark the Permalink. Craig shared this project which evolved with the assistance of the Octolively project. 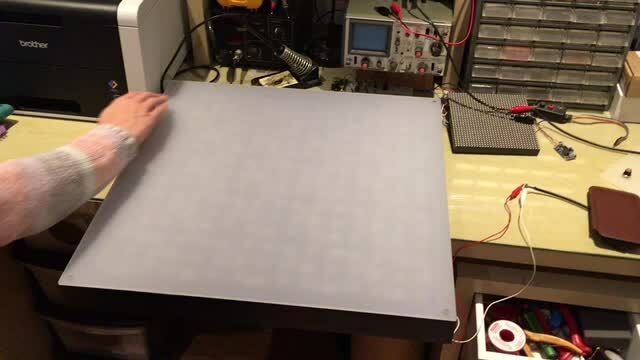 Thanks for the previous help you gave me when I was designing my own IR proximity boards. I thought you may want to have a look at the finished item. 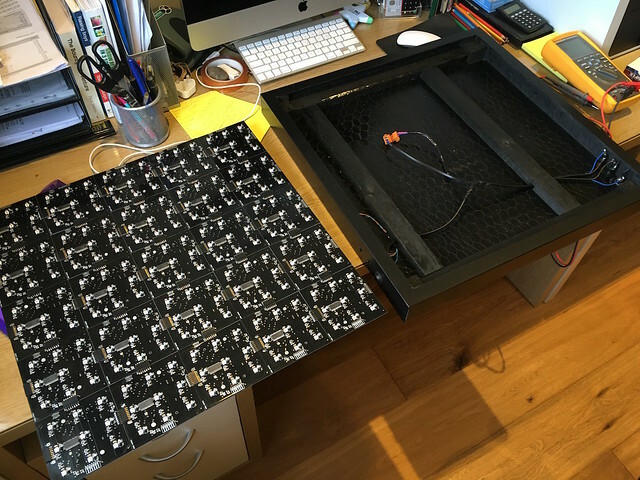 I have attached a picture of the 25 100mmx100mm boards and a video of the table working. Each one had a SOIC PIC 18F26K22 on it, with 9 IR transmitters and receivers and 9 x WS2812b addressable LEDs on. They all kind of communicate with each other so that each board does the same IR reading of the same ‘pixel’ at the same time as the others. I simply have a pin on the board which outputs low whan it is working (taking a reading’, then after it is done, it changes to an input pin, it continually looks at this pin until it goes high, meaning all the other boards have also completed that particular reading and then it’s on to the next one. I also have a calibration function so any thickness opaque covering can be put on the table top. I have 2 buttons on it. One to change the colour (including the rainbow fade) and also a button to change the fade speed. 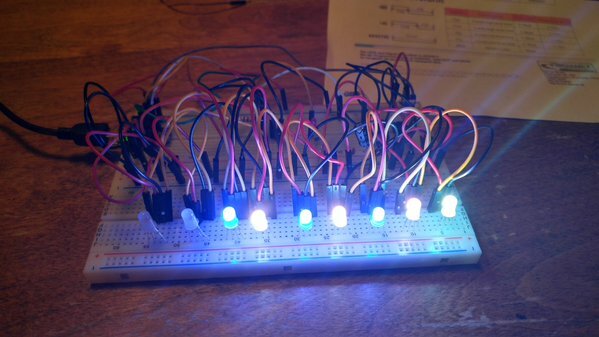 Thank you, Craig, for sharing your project! We’re glad you were able to get inspiration and helpful information from one of our projects. 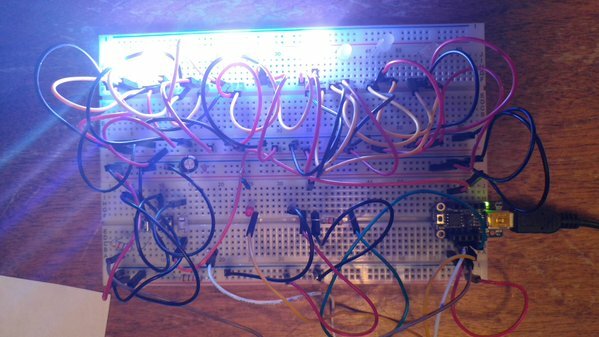 This entry was posted in Electronics, Microcontrollers, Open Hardware and tagged LEDs. Bookmark the Permalink. We continue to have fun with your Octolively module design. In the attached photo you can see why we decided to use sockets for the LEDs on our boards. We plan on changing out the display for each of the holidays. I was a little concerned at first about using the red LEDs with resistors that were chosen for white or blue, but they’re socketed, so replacing any that get damaged by overdriving should be easy! Looks like a fun way to celebrate at the office, and the snowflake tree-topper is a nice touch. 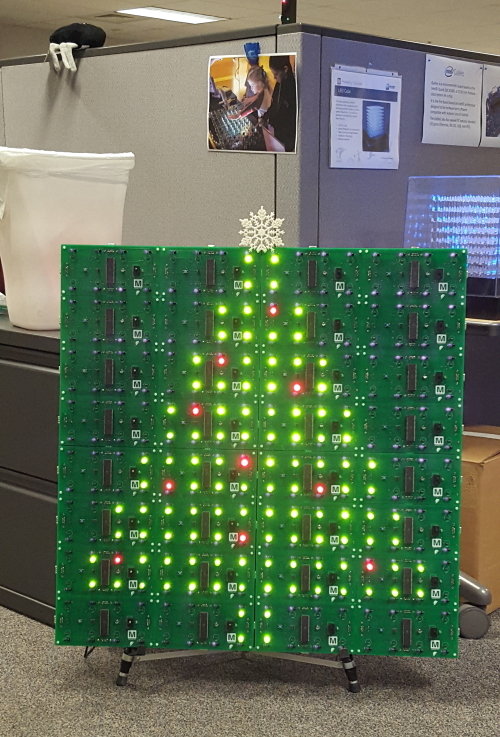 This entry was posted in Electronics, Microcontrollers, Open Hardware and tagged holidays. Bookmark the Permalink. This is why #OSHA is awesome! In a pinch+some parts we made our electronic menorah. 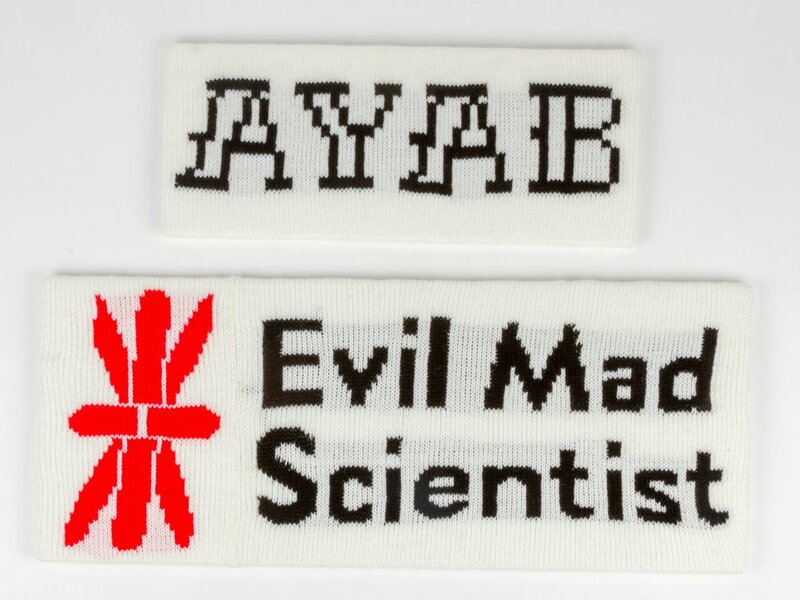 @EMSL design & @adafruit trinket. 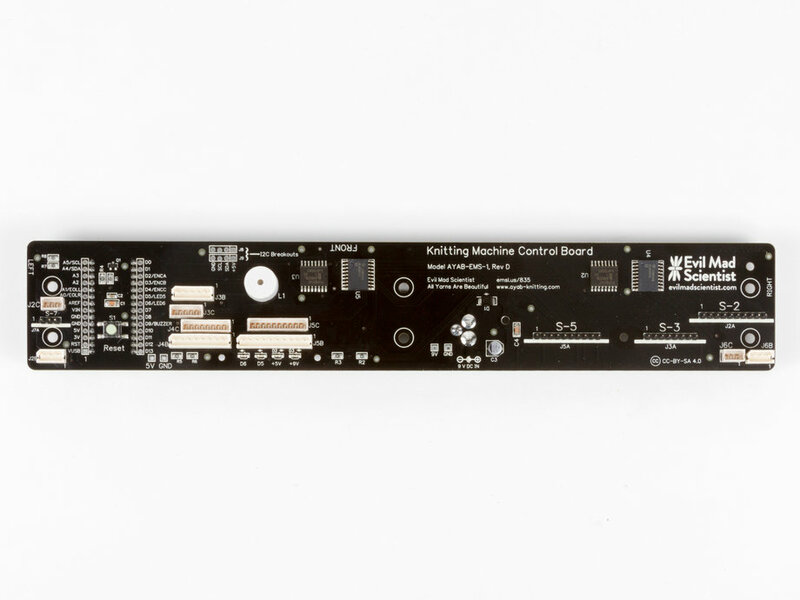 If you want to roll your own, the open source hardware documentation is on our wiki. If you’re not keen on the breadboard aesthetic for your hanukkiyah, you can still get the Mega Menorah 9000 kit. This entry was posted in Electronics, Microcontrollers, Open Hardware. Bookmark the Permalink. Introducing the Boldport Buggy kit. This simple and playful soldering kit is based on the on the beautiful Buggy circuit board designed by Saar Drimer of Boldport. The first version of this circuit board was created as a badge for the hardwear.io hardware security conference in The Hague. This new version of the Buggy is a complete kit, featuring an updated circuit board, with a power switch and six candle-flicker LEDs. A cool detail is that its six legs are actually the current-limiting resistors for those six LEDs. They are posable (giving it quite a bit of personality) and we have given it little red tubing socks to cover up the otherwise-conductive feet. The Boldport Buggy kit is available now at our store, and you can read more about its design at Boldport. This entry was posted in Electronics, EMSL Projects, Open Hardware and tagged art, boldport, LEDs. Bookmark the Permalink. OSHWA will create a new logo and trademark it. We will only put this trademark on open source hardware (as defined in the open hardware definition). If we use the logo otherwise (and do not stop when OSHWA repeatedly asks to stop), we agree to pay a hefty fine. OSHWA has not yet fleshed out the details — neither the new logo nor the exact contents of that license contract. It’s easy to be cynical about stuff like this. But instead, let’s please give them the benefit of the doubt and suppose that when those details arrive, it turns out that they’ve done a superb job: the contract ends up to be simple, well thought-out, straightforward and does just what it says. This entry was posted in Open Hardware and tagged open source, open source hardware. Bookmark the Permalink. 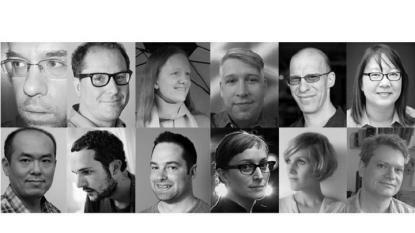 I’ve been participating in the Intel Open Source Hardware Advisory Panel this year. … Intel hosted a series of conversations with the company’s Open Source Hardware Advisory Panel – a group of key enablers in the global open source hardware ecosystem – about licensing, best practices, sustaining development communities, business models, path to product, Shenzhen, and the evolving relationship between the global maker movement and chip manufacturers. We’ve had some interesting conversations and Intel has been publishing video from our meetings. At the session titled Open Source Hardware Communities, Case Studies, and Guidelines, I talked about the EggBot and its communities of users; Adrian Bowyer talked about the RepRap community; André Knoerig about Fritzing; and David Scheltema about Make and Maker Faire. I enjoy seeing these issues being grappled with, and hope that our conversations will help others as they think about these topics. Videos from the sessions can be found on the panel page at Intel. This entry was posted in General News, Open Hardware. Bookmark the Permalink. MakerCon is a short conference put on by Maker Media in the week leading up to Maker Faire about the business of making. 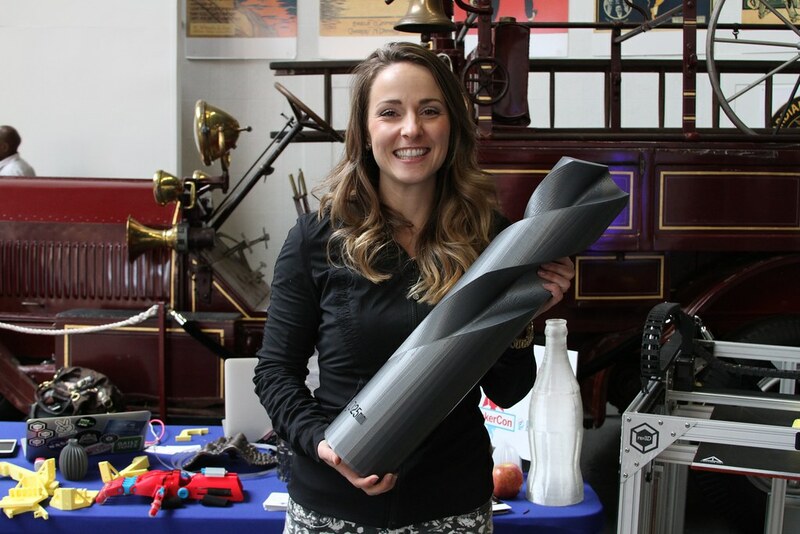 3D printing is a common maker topic, and MakerCon brought a few different twists to it. 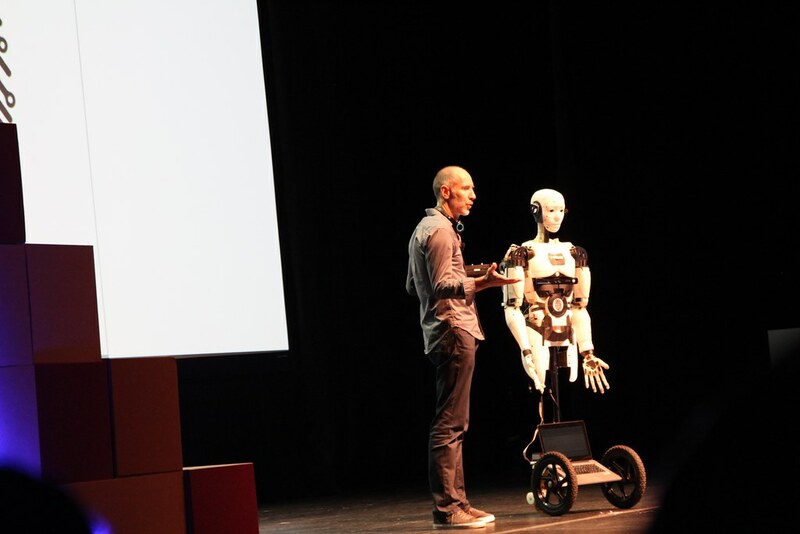 Above is Gael demonstrating InMoov, an open source 3D printed humanoid robot. There was also an incredibly inspiring talk about applications for medical 3D printing by Dr. Glenn Green. 3D printing can be whimsical as well, as demonstrated by this “25 mm” drill bit by Gigabot. 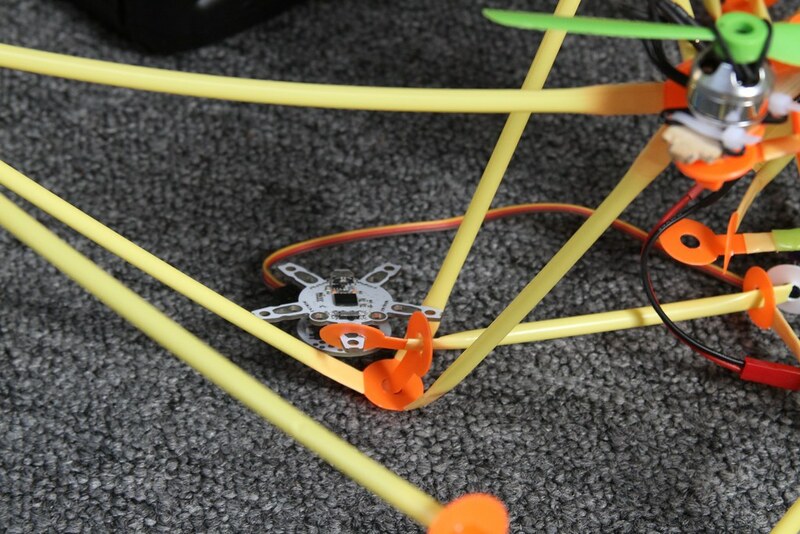 The folks from Strawbees had built a quadcopter rotor cage with a clever servo actuator for flapping sculptural wings. 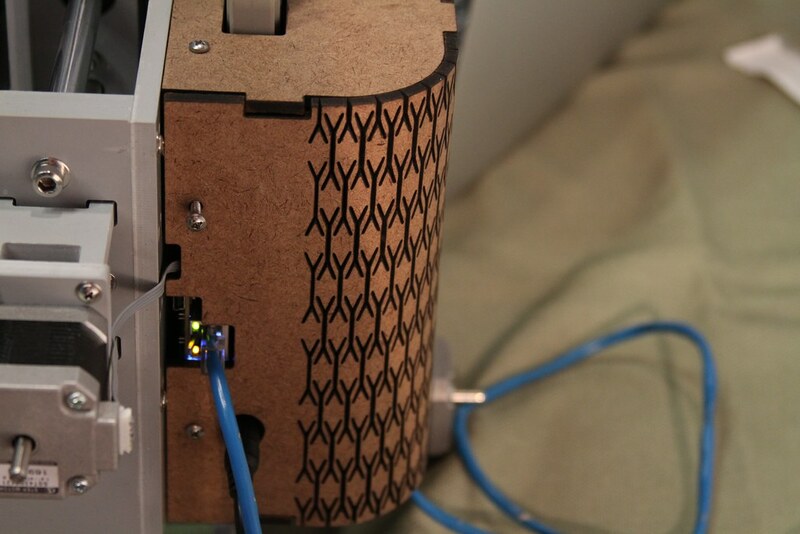 I enjoyed seeing this attractive laser cut living hinge at the BotFactory demo. 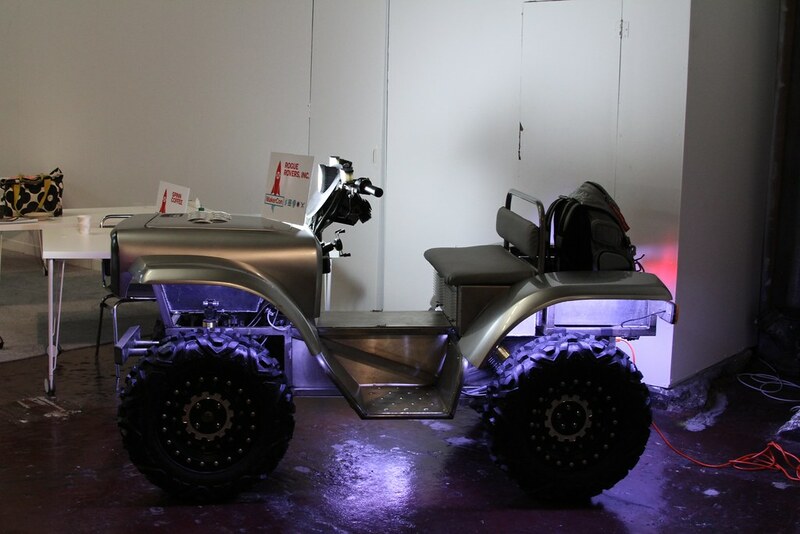 Rogue Rovers are electric semi-autonomous ATVs designed for agricultural use to reduce farm injuries and pollution. More pictures from the event are in my flickr album. 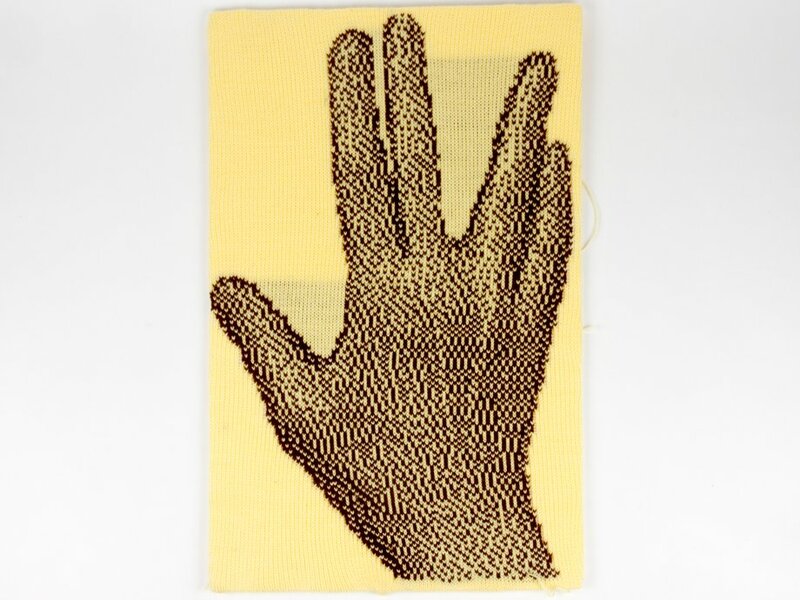 This entry was posted in Field Trips, Open Hardware, Robotics. Bookmark the Permalink. 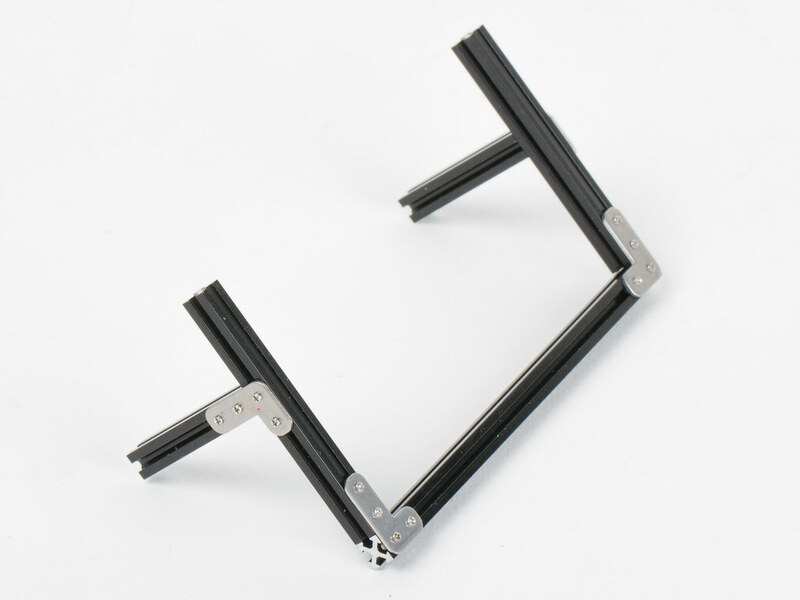 Last fall we wrote about NanoBeam, a new super-miniature open source aluminum T-slot profile construction set that was on Kickstarter at the time. 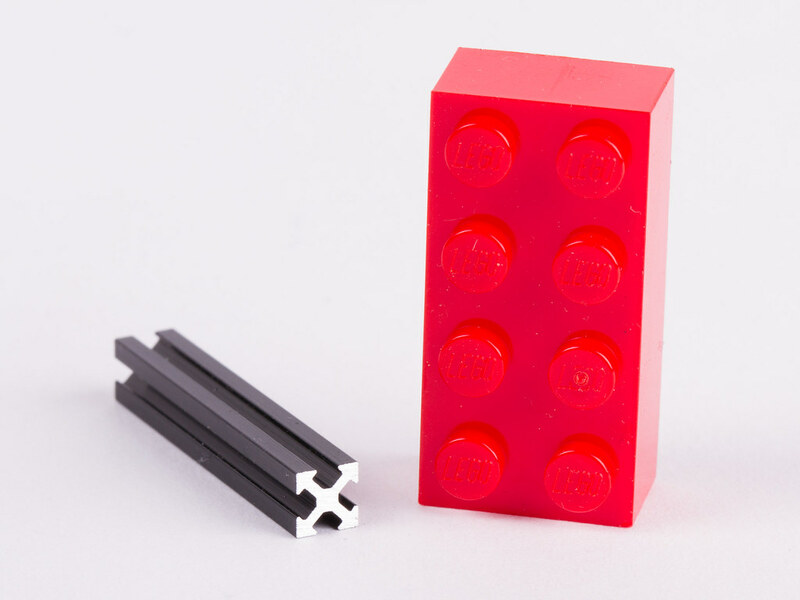 While comparable in design to industrial profile systems like 80/20, its cross section of just 5 mm × 5 mm is comparable to a stud on a lego brick. We recently got our tweezers hands on a ‘beam, and yes, it’s real, yes, it works, and yes, it’s that tiny. And just wait until you see the fasteners. This entry was posted in EMSL Projects, Open Hardware, Reviews. Bookmark the Permalink.